For those of you who don’t know what Rugby Sevens is, it’s a seven-a-side version of Rugby Union in which teams are made up of seven players playing seven minute halves, as opposed to the usual 15 players playing 40 minute halves. As a sport, it has seen a lot of growth over the last few years and is now an official Olympic sport. The game is popular at all levels, with amateur and club tournaments mostly held during the summer. Ireland are represented by both a men’s and women’s team, and they will both travel to San Francisco for the World Cup at the end of July for the competition which will be held at AT&T Park, the home of MLB Franchise The San Francisco Giants. Intersport Elverys have been proud title sponsors of the Mens and Women’s Irish Rugby Sevens Teams since 2016. Ireland’s continued rise and growth in the Rugby Sevens world continued unabated at the weekend as they came third in their very first HSBC World Rugby Sevens appearance. Playing at the home of English rugby Twickenham Stadium, they just made it through the group stage but Ireland shocked the USA and England in the knockout stage to secure a bronze medal. That was a massive achievement, especially when you consider that those two teams were much fancied by many to make the final of the tournament. To cap off a wonderful weekend for the Irish team, Jordan Conroy and Mark Roche made it onto the HSBC London Dream team of the tournament. Anthony Eddy’s men have a second chance to gain top tier experience as the invitational team for the final World Series tournament of the 2017/18 season in Paris this coming weekend. The team is overseen by IRFU Director of Sevens Anthony Eddy, IRFU Sevens coach Stan McDowell and team manager James Topping. It is worth noting that the majority of Ireland’s 13-man London squad were aged between 20 and 23, hopefully pointing to a bright future for the IRFU Men’s Sevens Programme. Next year Ireland will have the chance to secure core team status on the series at the Hong Kong qualifying tournament. Here’s hoping! Pool B: Australia 33-7 Ireland, Spain 10-38 Ireland, Wales 21-19 Ireland. Cup Quarter-Final: USA 12-22 Ireland, Cup Semi-Final: Fiji 38-12 Ireland, Bronze Final: Ireland 21-19 England. 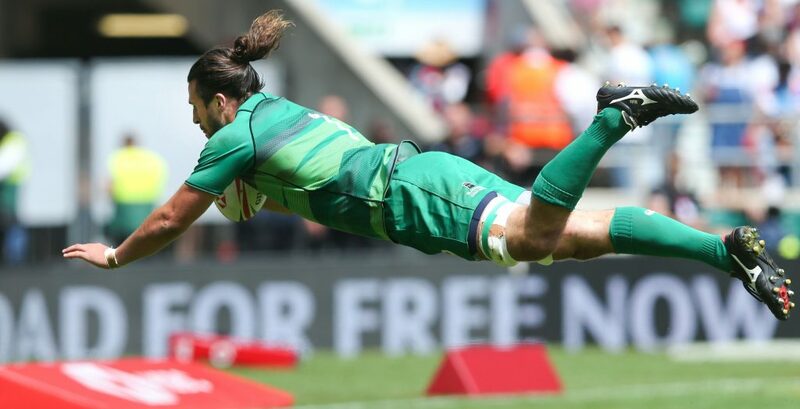 Intersport Elverys are the proud official sports retail partner of Ireland’s rugby 7s teams. You can pick up the jerseys in-store or online at Elverys.ie.